At the end of last year the US government announced that it had made a profit from its bank bailouts. The UK, on the other hand, probably won’t. So what did the Americans do right and we do wrong? As Leonid Bershidsky explained in Bloomberg earlier this month, conventional wisdom in 2008 was that the UK government was being tougher on the banks. At the time, Britain’s toughness on rogue bankers was praised and the leniency of the U.S. — which didn’t fully nationalize any big banks — was condemned. But that’s not how things worked out. It is at this point unlikely that all of the government’s initial cash outlay of $190 billion at today’s exchange rate will be recovered. The U.S. government, by contrast, actually made a small profit. The reason for this has much to do with the relative size of the banks and the country’s economy. The US has some big banks but also a very big economy on which its banks are dependent. The UK has some big banks but it is a much smaller economy and its banks are international. Bershidsky refers to this fascinating paper by Pepper Culpepper of the European University Institute and Raphael Reinke of the University of Zurich, Structural Power and Bank Bailouts in the United Kingdom and the United States. It’s worth reading the whole thing but here are some choice cuts. Large banks in the United States could not defy regulators, because their future income depended on the US market. In Britain, by contrast, one bank succeeded in scuttling the preferred governmental solution of an industry-wide recapitalization, because most of its revenue came from outside the United Kingdom. Financially strapped banks could not challenge the government in either country. They had to accept whatever policy the government offered, because only with government aid could they have survived. But healthy banks were not dependent on state aid. Healthy banks in Britain were in a better position to resist the state, and they drove a better deal for themselves than did US banks. As a result, the British government absorbed more risk than the U.S. government and lost its taxpayer more money. In effect, the U.K. provided a costless subsidy to its healthy banks, which benefited from the stabilization provided by the bailouts without having to contribute to their cost. In contrast, the U.S. profited from its bank bailout, because it was able to bully healthy large banks such as JP Morgan and Wells Fargo into a collective recapitalization plan. Both governments, effectively, insured their banks against losses, providing debt guarantees and capital injections while charging a fee. Insurance is a profitable business if nothing goes wrong. That’s why insurers try to cherry-pick the best clients and discourage the riskier ones. The US government forced all its banks to participate in the bailout, even those banks that were not in trouble. This was, after all, about restoring confidence in the banking sector as a whole. Therefore, so the argument went, even the healthy banks would benefit so they too should pay. The UK government wanted to include HSBC in the recapitalization plan, but HSBC refused. Multiple figures associ- ated with the bailout repeated in interviews with us that the UK government had no tools to force HSBC to take state capital, even though it was the government’s first preference. Barclays never wanted state capital, but when the government negotiated the plan, it was unsure whether it could raise capital privately. Once HSBC quickly announced it would not take state capital,47 Barclays made clear it would go to extraordinary lengths to refinance itself through its share- holders rather than taking state money.48 Barclays kept the option of state capital open until, a few days later, it succeeded in raising the required capital. By then, the govern- ment had announced its debt guarantee programs, which eased funding for Barclays and helped the bank to convince investors to provide capital. [Barclays] played us very cleverly, in that they managed to negotiate a sum of capital, which they had to raise and that they could raise—from their friends in Singapore and the Middle East and so on. And thereby pass our test, while still getting the benefit of the overall government guarantee. In other words, they benefitted from the improved confidence in the banking sector that came from the government’s bailout without actually having to pay into it. To stretch my insurance company analogy, rather than cherry picking the good clients, the British Government was left with the basket cases. The US government, by contrast, was able to charge all its banks fat fees for insuring them and sell off its shares at a profit once the sector recovered. It incurred some losses from the bailout but it more than covered them with its gains, like any good insurer would. With its payment structure—capital injections and warrants— the US government could recoup its money. It allowed the government to internalize some of the positive external effect of its rescue program. Getting the warrants in the nine major banks generated over $4 billion, and $3 billion of that sum was paid by banks that did not need capital injections: Wells Fargo, JP Morgan, and Goldman Sachs. How did the US government get its banks to play ball? It bullied them. US regulators could make Wells Fargo and JP Morgan an offer they could not refuse. In the decisive meeting between the CEOs of the nine major banks and senior US government officials—Paulson, Bernanke, Tim Geithner of the New York Fed, Sheila Bair of the FDIC, and Comptroller of the Currency John Dugan—this regulatory threat was explicit, and it was repeated. In the talking points prepared for the meeting on October 13, 2008, recalcitrant banks got this message: “If a capital infusion is not appealing, you should be aware that your regulator will require it in any circumstance.”43 After Paulson’s presentation of the plan, which reiterated the unpleasant consequences of not accepting the aid, the CEO of Wells Fargo complained to the other CEOs “Why am I in this room, talking about bailing you out?” Paulson’s response was a threat of regulatory consequences: “Your regulator is sitting right there [pointing to the head of the FDIC and the comptroller of the currency]. And you’re going to get a call tomorrow telling you you’re undercapitalized and that you won’t be able to raise money in the private markets.”44 This is an explicit threat from a regulator against a financially healthy bank. The regulator could make trouble for the bank in unsettled markets—the regulator knew it, and the bank’s CEO knew it. The US regulators are not people you want to mess with. This different policy was not a matter of different governmental preferences in the two countries. The British government also recognised the virtues of a collective plan that would have forced all large banks to take government money. Yet the British government faced a powerful opponent, over which it held limited leverage: HSBC, a large player in the British market, but a bank based in Asia, which does just twenty per cent of its business in the United Kingdom. HSBC was able to reject the proposal of the Labour government that it take public money, because it was in a position in which UK regulators could do only limited damage to its future prospects. This contrasted with the case of the healthy American banks: JP Morgan earned more than 70 per cent of its revenue in the US, and Wells Fargo 100 per cent. Banks so heavily dependent on the US market were unable to defy the threats of American regulators, given the costs those regulators could impose on them in the future. The story of these bailouts is indeed one of the power of banks. Yet the power that matters is a function of the economic footprint of banks, not their lobbying strength. The different fate of the two bailouts should lead scholars and policymakers to pay increased attention in the future not merely to the lobbying muscle of banks – what political scientists call their “instrumental power” – but equally to the way in which their role in national economies gives them “structural power” in dealings with government. In 2008, Barclays, HSBC and RBS were three of the biggest banks in the world. Based on assets, RBS was the biggest, on capital it was HSBC. 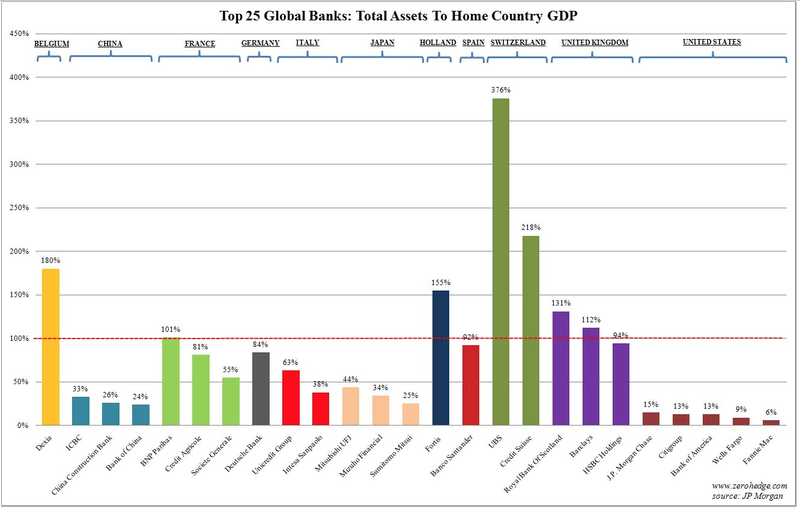 The US banks were up there too but, relative to the size of their country’s economy, they didn’t loom anywhere near as large, as this chart from Zero Hedge showed. A big country can bully big banks. A small one can only bully them when they are weak. Why did the US make a profit on its bailouts and the UK (and most other countries) probably won’t? In the end, it all comes down to one word. Power. So what you’re actually saying is that the US government’s extra power allowed it to get what it wanted by behaving illegally, threatening a solvent bank with the banking regulator? In a ‘Nice bank you’ve got, shame if something happened to it’ manner? How would you like it if the State turned up at your door demanding something and threatening you with an tax investigation if you refused? Govt profit = private sector loss. In MMT, the idea of government trying to make profits is questionable. As to power, I agree, “corporate confidence” is used by capitalists. Having full employment would allow the government to let banks and businesses fail without worry of job losses. What about the bank tax levied since 2011? Isn’t this an alternative way of making the banks pay for the positive externality of securing the banks’ future? I think this is somewhat too kind to Darling – there were many levers to use to bring Barclays and HSBC into line. Both benefit hugely from being British banks from a legal standpoint. Of course, people like Jim are much happier with the Darling approach. The UK government’s position would have been greatly improved had they taken 100% ownership of RBS in return for the bailout. Presumably they limited the stake to around 82% to keep the listing, but it has to be asked was that a price worth paying in view of the fact the government is virtually certain to make a substantial loss on its investment.